In a 2016 issue of Green Building & Design magazine, contributor Brian Barth describes how Customs and Border Protection utilized AgilQuest's OnBoard and Commander BI to help facilitate major space consolidation projects that netted millions of dollars in annual savings, and made a better work environment for its people. - Aron Beninghove, and architect contracted by the CBP to act as facilities lead for the project. Housed within the Department of Homeland Security, the Customs and Border Protection agency took huge steps to reduce square footage in response to the White House's "Freeze the Footprint" policy. 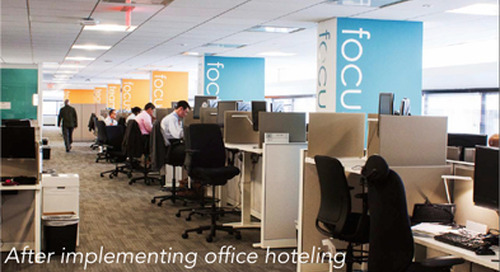 They did so with a tremendous consolidation of existing space and by implementing a more mobile workplace environment. With employees working from home at lease two days a week, CBP's people report much better work/life balance and the reduced office space has ample resources for those working in the office on a given day. CBP's transformation took place in two phases: The first took 80 employees spread across two floors and nearly 14,000 square feet and consolidated them to one 8,700 square foot floor with 27 desks. For this phase alone, CBP calculates an annual savings of $287,000 in rent, while employees are seeing $600 in annual savings in commuting costs. For phase two, 550 employees went from seven floors across three buildings to three floors in one building. By reducing square footage by 46%, CBP calculates a savings of $3.3 million a year in rent and operational costs. Not only are the financial benefits from this project huge, employees are seeing positive changes in their worklife. Communication and collaboration is widely reported as improved as well as worker productivity. Visit our case study page to read more about how Customs and Border Protection was able to implement this change, how AgilQuest's technology helped make it possible. The original article appears in Green Buildings & Design magazine.